Which are your favorite “occupations”? 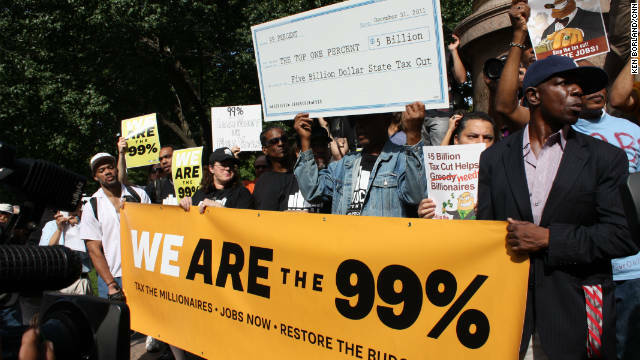 The “occupy” meme is spreading like, well, like a meme, across the activist landscape. Whether because of its inversion of the narrative of a government addicted to overseas occupation, its simplicity, or simply its success, the meme continues to inspire and morph. Here are some of those I’ve run across, some serious, some funny. What am I missing? 2. Occupy (insert city here): Boston, Seattle, Johannasburg, Warsaw — The list could go on forever. See Wikipedia for a substantial list. 6. Occupy Sesame Street: Muppets in solidarity! 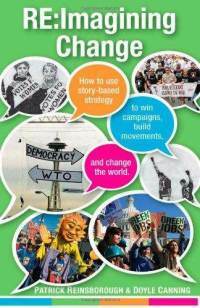 How to use story-based strategy to win campaigns, build movements, and change the world. Human beings make sense of the world through stories. The narratives we as individuals construct about our lives — based on our experiences — tell us who we are, where we came from, and how we came to be this way. The myths societies produce tell us who we are collectively, how we should relate to one another, and what constraints and possibilities we face. Just as we see faces in all kinds of unexpected places, we see stories everywhere. And numerous industries in our modern world are dedicated to story production: from movies, theater, and television, to advertising, journalism, motivational speaking, and political campaigning. Just as stories can aid understanding, they can also inhibit it. Just as they can open our eyes, they can blind us. So stories are inextricably linked to power. They make up what John Gaventa (1980) calls the “third dimension” of power — the power to create meaning, to shape what can be thought about and what is inconceivable. Some stories are told so often that they become “common sense” or “the way things are.” Such stories, or dominant narratives, maintain the current power structure and imply that it is “natural” or “right.” But these stories are constantly being contested by counter narratives, alternative stories that challenge these common sense notions of truth. To some extent the importance of story is common knowledge in the world of social change. Sharing personal stories of struggle or empowerment is central to organizing — first in personal conversation, and later in the public sphere. But though many know stories are powerful, few have taken it as far, or gone as deep, as SmartMeme, a San Francisco-based movement-building organization that offers training and consulting on how progressive organizations can use “story-based approaches” that “amplify the impact of grassroots organizing and challenge the underlying assumptions that shape the status quo.” In Re:Imagining Change: How to use story-based strategy to win campaigns, build movements, and change the world, SmartMeme co-directors Patrick Reinsborough & Doyle Canning outline the theory and practice behind the organization’s work. They describe how organizations can disrupt dominant narratives and shift discourses in ways that facilitate change. After a brief introduction, the authors walk readers through the process of narrative power analysis, in which participants deconstruct the dominant stories, or control mythologies, that under-gird oppressive systems. Next they explore the battle of the story — creating and disseminating counter narratives based on the truths of those marginalized by mainstream discourse. The central tool used in communicating these narratives is the meme. A term first coined by evolutionary biologist Richard Dawkins, and made popular by viral on-line media, memes are the smallest unit of culture: “self-replicating units of cultural information that spread virally…with a life of their own” (p. 32). Next the authors map out what they call points of intervention, the specific moments and spaces — both physical and discursive — where the new story can be inserted. Finally, the authors offer four case studies of campaigns that used a story-based strategy. Throughout this step-by-step guide, Canning and Reinsborough introduce key concepts on which they base their ideas, coining a number of terms along the way. But they do not claim to have invented story-based strategy. Rather they see it as something that has emerged — and will continue to develop — through on-the-ground organizing practice, both by them and by others. They also are purposeful in clarifying that story-based strategy is not the totality of organizing, or even the most important part; it is not a replacement for the more traditional work of relationship building, mobilizing, etc. But they do make a strong and compelling argument that this aspect of political change is under-appreciated, or at least underutilized, and that movements for social justice could benefit from more intentionality around the stories we tell, and how we tell them. Canning and Reinsborough are obviously very interested in their book being widely accessible. While a book on political strategy will never quite read as easily as a Dan Brown novel, Re:Imagining Change succeeds in being eminently readable. Considering how complicated and dense questions of cultural narratives can be (If you’ve ever given reading Foucault a shot, you’ll know what I mean) this is a remarkable achievement — paired with a huge amount of useful information packed into an non-intimidating 118 pages. Though the occasional chart can get a bit overcomplicated, the authors do something that many social scientists and political writers should pay close attention to: they clearly define every one of their terms. They even have a glossary, but everything was so well explained that I never needed to use it. One core assumption that underlies the book’s argument is that story-based strategies are effective in helping to bring about social change. As an artist and writer I personally am on board, and the fact that the authors are able to pull examples from decades of activism to illustrate their ideas implies that the collective, hard-won knowledge of activists and organizers supports this assumption as well. Still, there were moments in the book where this assumption was stretched. For instance, one action highlighted was Earth First’s banner that looked like an enormous crack in the Glen Canyon Dam. This, the authors argue, was meant to challenge the dominant narrative of dams as permanent and immovable. In the next paragraph they say that, twenty-five years later, this narrative has shifted and dams are seen as something one can remove. The implication is that this “iconic action” helped to make that happen, but is that true? How much did it, and similar story-based techniques, really have an effect — compared to other aspects of anti-dam campaigns? Certainly these are difficult, if not impossible, questions to fully answer, and I say this not to put down the argument — which I think is sound — but because this could be a useful area for further exploration. When an organization is trying to decide where to put its limited resources in a campaign, how much should go to this kind of work? And perhaps more importantly, how can one gauge the effectiveness of such framing actions afterwards? Where do we look for evidence that our stories took hold and really changed the discussion? Almost immediately upon reading Re:Imagining Change, I found myself using it. An organizing campaign sprung up at the Harvard School of Education, which sought to challenge the school around how it addressed (or didn’t) issues of race, community, and organizing in education (among other things). We had many different takes on the campaign, and a real tough time coming up with a clear message. But as the person in charge of our online media work, and making buttons (since I had the button maker), I desperately needed a clear name or short statement of who we were. I needed a meme. After a number of conversations with my partner, and a lot of emailing, I picked up Re:Imagining Change and skimmed through it again looking for advice. Two pieces popped out at me. The first was the concept of a meta-verb, a single verb that summarizes the logic of a campaign. The second was the idea of repurposing popular narratives. I offer this example not because it’s that great of an illustration. It is a mediocre meme in a very small campaign (though I was pretty proud of it). I offer it to give what I think is one of the greatest compliments you can give to a book like this: While playing with very big ideas, it remains relevant to the day-to-day work of organizing. It is usable knowledge, and it will change your work for the better. Gaventa, J. (1980). Power and powerlessness: Quiescence and rebellion in an Appalachian valley. Urbana: University of Illinois Press.